The Garter King of Arms is, as I am sure you know, the senior of the three English Kings of Arms. The office takes its name from the Order of the Garter. Henry V instituted the office of Garter in 1415 just before sailing for France. My experience of his office is recounted here when he argued with me about the correct spelling of Haringey given the way it was done in the Domesday Book. However, the College of Arms keeps itself up-to-date and in these straitened times is always on the look out for new sources of income. A little bird tells me that he has written to all Chief Constables to remind them the Police Reform and Social Responsibility Act abolishes police authorities and transfers their powers to elected Police and Crime Commissioners. You may wonder why this is of concern to the Garter King of Arms (Chief Constables haave their own concerns about this). The answer, of course, is straightforward: the Armorial Bearings used by most police forces on cap badges, letterheads, websites etc were granted to Police Authorities. And, if Police Authorities disappear, the right to bear the Coat of Arms lapses with them. This would potentially make the cap badges on police helmets illegal. I am sure many police officers – and certainly their Chief Constables – would find this a deeply discomforting situation. And please form an orderly* queue outside the College of Arms …..
*Any disorderly behaviour will be dealt with the City of London Police – as the College of Arms lies within their territory – and of course they are one of the few forces not affected by the Police Reform and Social Responsibility Act and will not have an elected Police and Crime Commissioner. Why won’t the Government answer questions about Lord Green? The House of Lords, unlike the House of Commons, is still sitting and this afternoon Baroness Jan Royall, Leader of the Opposition, asked a Private Notice Question of the Leader of the House, Lord Strathclyde, about the position of the Trade Minister, Lord Green of Hurstpierpoint. “The US Senate has launched a coruscating attack on HSBC for its slapdash approach to money-laundering regulations. The bank could face a $1 billion fine. The Government’s answer boils down to saying that there is nothing that casts doubt on Lord Green’s integrity and that there is no reason that he should be held responsible for everything that the organisation of which he was chairman was doing. However, what was he doing as Chairman of the Bank during this time? If the Bank were warned by both the Mexican and US authorities that transactions of $7 billion were tied to the illegal drugs trade, shouldn’t he have been told of the warnings. If he wasn’t, why wasn’t he and what sort of system of corporate governance was he presiding over if it was not felt that such warnings should be conveyed to the Board? Is $7 billion too small a sum for him to worry about? And if he was told, what did he do about it? To ask Her Majesty’s Government what assessment they have made of the impact of the allegations about HSBC made by the Permanent Subcommittee on Investigations of the United States Senate Committee on Homeland Security and Governmental Affairs on the ability of Lord Green of Hurstpierpoint to fulfil his ministerial duties. The Chancellor of the Duchy of Lancaster (Lord Strathclyde):My Lords, Her Majesty’s Government have every confidence in my noble friend Lord Green’s ability to fulfil his ministerial duties. His experience, expertise and enthusiasm provide great benefit to the UK’s international profile and to the support that UK Trade and Investment provides to British businesses. Baroness Royall of Blaisdon:My Lords, I am grateful to the Leader of the House for that Answer. However, as the noble Lord will be aware, questions have been asked about the present ministerial role of the noble Lord, Lord Green, following the US Senate committee’s findings. “Ministers should be as open as possible with Parliament and the public, refusing to provide information only when disclosure would not be in the public interest”. Given that obligation, will the Leader of the House ask the noble Lord, Lord Green of Hurstpierpoint, to come to your Lordships’ House to place on record what he knew and when about the matters investigated by the US Senate committee, including what steps he took to deal with them? Would such a move not give the noble Lord, Lord Green, the opportunity to dispel once and for all the questions being asked about his present ministerial role? Lord Strathclyde:My Lords, I congratulate the Leader of the Opposition. I know that she has been trying to find a PNQ to put to the House and she has managed to do so. I am very glad to be able to respond on behalf of Her Majesty’s Government. There is no urgency in this matter. The investigation started more than two years ago. The report in question was published two weeks ago. There was no evidence of personal wrongdoing of my noble friend; indeed, there was no personal criticism whatever of my noble friend. The investigation is ongoing. As for ministerial accountability, my noble friend Lord Green is accountable to this House—to Parliament—for the work he does as a Minister. However, many Ministers have had previous careers. No Minister needs to be accountable to Parliament for their previous career, only for what they are doing as a Minister. Lord Butler of Brockwell:My Lords, I declare an interest as a non-executive director of HSBC during the time when the noble Lord, Lord Green, was chief executive officer and chairman. Is the Leader aware that when I was advising the Prime Minister on calls for ministerial resignations, I drew a distinction—which I think is widely accepted—between accountability and responsibility? While it may be the case that the chairman and chief executive officer of a major international company is accountable for everything that happens in that company, there is no possible way in which they can be responsible for everything that happens in a worldwide group of the size of HSBC. Lord Strathclyde:My Lords, with all his experience and knowledge—not just as head of the Civil Service and Cabinet Secretary but having had a more commercial career since he left—the noble Lord, Lord Butler of Brockwell, has brought a lot of wisdom and good sense to this debate, on which we should all reflect. Lord Kinnock:My Lords, since the Leader of the House has told us that the work of the noble Lord, Lord Green, is of benefit to the United Kingdom’s profile—the words he just used—does he think that the accountability of an individual in a very senior position in Government or business ceases when that individual changes post? Does he not think that it would benefit the UK’s profile to ensure that a Minister rigorously adheres to the wording of the Ministerial Code, as just spelt out by my noble friend? Further, does he not think that the ethics of business require that a Minister who has the opportunity and the right to come to this House to explain themselves should do so? Lord Strathclyde:My Lords, I do not disagree at all with what the noble Lord says about the ethics of the industry in which my noble friend was involved. In fact, only last week, this House set up a special Joint Select Committee to look at ethics and many other practices in the banking industry. Surely that is the point. If a Select Committee of this House or another place wishes to ask my noble friend questions, it should do so. My purpose is to reflect on my noble friend’s role in government and to answer on behalf of Her Majesty’s Government. Lord Cormack:My Lords, does my noble friend agree that anyone who knows the noble Lord, Lord Green, could not doubt his total integrity for a moment? Lord Strathclyde:My Lords, I agree with that but I wholly accept that questions need to be asked—and are habitually asked—of a Minister to make sure that he is accountable to Parliament. As I said in my reply to the noble Lord, Lord Kinnock, if a committee of Parliament wishes to put questions to my noble friend, it is entirely free to do so. “We … recommend that there should be a monthly question time dedicated to questions on House of Lords matters addressed to the Leader of the House”. Perhaps I may helpfully suggest that both today’s Question and indeed the very important one raised last week by my noble friend Lord Barnett could be handled were the Leader to accept that simple, unanimous recommendation by a committee that was set up at his instigation. I urge him to act on that recommendation as soon as possible. Lord Strathclyde:My Lords, from memory, I do not think that there has been a single Question put to me in my capacity as Leader of the House in the past 12 months. That rather leads me to believe that there is no great demand for a monthly Question Time session for the Leader. There are perfectly good methods for asking me questions and noble Lords should use them if they wish to. Lord Hughes of Woodside:My Lords, from a rather different view, perhaps, I query what was said by the noble Lord, Lord Butler. Surely accountability and responsibility cannot simply be divided one from the other—it is not as sharp as that. Accountability and responsibility go hand in hand and no one should doubt it. Lord Strathclyde:My Lords, my noble friend Lord Cormack said that no one should challenge the integrity of my noble friend Lord Green, and I agree with him. But if it comes to a choice between the noble Lord’s view of what is responsibility and accountability and that of the noble Lord, Lord Butler of Brockwell, I will go with the noble Lord, Lord Butler of Brockwell. Baroness McIntosh of Hudnall:My Lords, I personally—along with most of the House, I feel—am in no position and would not wish to challenge the integrity of the noble Lord, Lord Green. However, does the Leader of the House agree that perhaps there would be less question about his conduct over the issue of HSBC were the House to see him more often answering questions that relate to his ministerial responsibilities? It may have something to do with his relative unfamiliarity to Members of the House that they are perhaps more sceptical than they should be. Lord Strathclyde:My Lords, as a Minister for trade, my noble friend of course spends a great deal of time overseas. Since he was appointed, he has travelled to 42 countries and visited 73 cities. In his role as Minister of State for Trade and Investment, he has answered a total of 72 Parliamentary Questions, including two Oral Questions out of three that he could have answered. The response to the point raised by the noble Baroness is that if more Questions on trade and investment were put down, I am sure that my noble friend would be very happy to come and answer them. Baroness Royall of Blaisdon:My Lords, I thank the noble Lord for his answers, but perhaps I may say that I found his initial response to my Question slightly patronising, albeit not in terms of the substance. I table PNQs when I believe that there is a matter of accountability which is of interest to this Parliament as a whole—we are the only House of Parliament sitting at the moment—and when I believe that it is of importance to this nation. I do not do so for personal gratification. Lord Strathclyde:My Lords, if the noble Baroness felt that I was in any way seeking to patronise her, I apologise fully. Has the Leader of the House of Lords lost it – or is he just in need of a holiday? 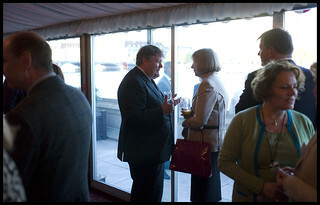 Thomas Galloway Dunlop du Roy de Blicquy Galbraith, 2nd Baron Strathclyde, is Leader of the House of Lords. This afternoon he lost his temper with the venerable Lord Joel Barnett. His asperity was in contrast to what is normally expected of the peer who is supposed to be Leader of the whole House and not just of his particular faction in the Government. As you know, I am not one to gossip, but privately his colleagues are whispering that he is under stress. Downing Street has been questioning his performance and, in particular, his failure to deliver his not-so-merry band of Conservative peers in support of House of Lords reform. There are even rumours that he might be replaced in David Cameron’s Government reshuffle – should it ever happen. Moreover, so I am told, no less a personage – if such a thing were possible – than the Baroness Anelay of St Johns, the Government Chief Whip and Captain of the Honourable Corps of Gentleman-at-Arms, has let it be known that she is ready to take on the burden of the Leadership were it to fall on her shoulders. (It is not, of course, immediately apparent why Baroness Anelay – aka “The Steel Magnolia” – would have more success than the hapless – and grumpy – Lord Strathclyde in keeping the rebellious Tory peers in line.) This is all in private: publicly she says her only ambition is to play golf again at Woking Golf Club. So Lord Strathclyde’s extraordinary rebuke of Lord Joel Barnett (who first entered Parliament when Lord Strathclyde was four years old) is seen as a sign of stress and the only question on the lips of Tory peers is whether a summer holiday will be sufficient or whether an urgent course of anger management lessons is going to be necessary. The Joint Committee on the National Security Strategy (of which I am a member) has just published a report criticising the Government for failing to take seriously the concerns that it expresses in its First Review of the Strategy. In particular, the report points out that the Government has failed to respond adequately to the Committee’s concerns about the implications for the National Security Strategy of major shifts in US strategy, of the Eurozone crisis and the potential impact of Scottish independence. The Joint Committee had urged the Government to press ahead with planning the next national Security Strategy, allowing sufficient time to involve academics and experts external to the Government in the process and to allow the next Comprehensive Spending Review and the Strategic Defence Review to be properly integrated in the process. The 2010 National Security Strategy was rushed and weaker as a result. The Government has acknowledged that it is “important to start thinking about the work plan” for the next National Security Strategy “well in advance of 2015”. However, there is no indication that any effort has been made to start drawing up plans to ensure that the next Strategy is a more candid and more explicit document that properly addresses difficult questions. Even more disturbing is the absence from the Government of any indication that it intends to draw up the next Strategy in a way that achieves a broad national consensus on the foundations necessary to plan for our nation’s security in the longer -term. Failure to build such a consensus will be a wasted opportunity – without such a consensus any future Strategy will not have abroad enough basis of buy-in and consent and that in turn will weaken the Strategy and also National Security itself. Are the changes in voter registration designed to help the Conservatives as changes in voter ID laws in the USA are designed to help the Republicans? The Government is pushing through changes to voter registration in this country. This will mean that each elector will have to fill in a separate registration form – a change from the current arrangements where only one form per household is required. This is allegedly designed to reduce electoral fraud. With research suggesting that the numbers on the electoral register will plummet under the proposed new arrangements in this country, can we expect a gung-ho David Cameron boasting to a future Conservative Party Conference that the Electoral Registration and Administration Bill (interestingly introduced in the House of Commons by Nick Clegg) will deliver a future Tory election victory? Today was the Second Reading debate in the House of Lords on the Crime and Courts Bill, which amongst other things creates the new National Crime Agency. “My Lords, I should declare my interests as chair of the Audit Panel for the Metropolitan Police and the Mayor’s Office for Policing and Crime, and as an adviser to KPMG, Airwave Solutions, Lockheed Martin UK and a number of other companies that provide services to police forces around the country. It is a privilege to follow the noble Lord, Lord Condon, in the debate. I, too, want to speak primarily about Part 1 and the new National Crime Agency. The Government’s intention to create a National Crime Agency has been known about for almost two years. However, we have yet to hear a clear explanation of what the problem is with the existing arrangements that these changes are required to fix. I am sure that the Government’s policy is, “If it ain’t broke, don’t fix it”, but perhaps it goes a bit further than that by saying, “Even if it doesn’t need fixing, take it to pieces anyway”, because we are not at all clear about which problems will be solved by these reorganisations. Given that the Government’s intentions have been clear for the past two years, we have to ask what has been going on during that period. We still do not have a definitive version of the strategic policing requirement, and we do not see any sign of the NCA framework document, even in draft, although it is pivotal to understanding how the new arrangements will work. My understanding is that, because of this pending reorganisation, senior people in SOCA and the other agencies have spent the past two years sitting in meetings arguing with officials from the Home Office and other bodies rather than devoting themselves to their main purpose, which is that of fighting serious and organised crime. But all the meetings that have taken place over the past two years seem to have failed to produce anything definitive on how the new arrangements are supposed to work. What we are told about the likely organisational structure suggests that we are going to have a series of silos that are spatchcocked together. If that is all it is, frankly it is not clear why the reorganisation is better than a general injunction on the different organisations that currently exist to work together better. Moreover, there remains a lack of clarity about one of the central issues as to how the agency is going to work—a lack of clarity about the powers of tasking and co-ordination, whether voluntary or mandated. We spent many happy months in your Lordships’ House discussing the Police Reform and Social Responsibility Act. That Act clearly states, as does the policing protocol, that elected police and crime commissioners are responsible for the totality of policing within their jurisdiction and that they alone are publicly accountable for the delivery and performance of policing. That responsibility is placed clearly in their hands on behalf of the electorate. Under this Bill, directed tasking arrangements allow the Home Secretary to empower the director-general of the NCA and allow the director-general of the NCA to task police forces and other law enforcement agencies to carry out specific activity. While the PCC would have to be notified when such a direction is initiated, this tasking would in practice interfere with the operational independence of the chief officer as set out in the Police Reform and Social Responsibility Act, and interfere with the police and crime commissioner’s responsibility for the totality of policing. My prediction is that, unless this is handled correctly and there is rather more substance to it than is contained in the Bill, conflict is going to be inevitable. The whole point of these new accountability arrangements created by the Government is that police and crime commissioners will be elected with a mandate to deliver in respect of local concerns. That is what they are there to do. What is going to happen when the elected police and crime commissioner for Loamshire or some such place decides that his or her number one priority is going to be addressing volume street crime in Loamshire and its larger towns and yet suddenly there is a directive to divert resources from Loamshire to somewhere else to help deal with particular problems of organised crime, when for the public of Loamshire—the electorate that elect the police and crime commissioner—organised crime is not a particular issue facing that local community? How that is going to be managed is not clear from the Bill. Indeed, the whole Bill poses a series of questions. Who is accountable to the public for activity that is being directed? When things go wrong—as they will—is the Home Secretary or the NCA director-general liable for any repercussions from this activity? How is this going to interfere with the PCC’s setting of local strategic priorities and indeed that accountability of PCCs to the public that the Government tell us is so critical? Will the police and crime commissioner for Loamshire or for any other area be able to veto a direction using his or her powers? Presumably that will be the case if it is a voluntary direction because that is my understanding of what “voluntary” means. What if it is not? What are the implications if the chief officer of police accepts a voluntary direction but his or her police and crime commissioner says, “No, I do not think that is in the interests of our local community, which I am elected to defend”? How is that going to be resolved? Who will be responsible under those circumstances? Of course, the Government have got a let-out clause, as you would expect. I am sure the Minister is aware of paragraph 30 of Schedule 3, which gives the Home Secretary the power to amend the requirement to get prior consent before issuing directions. So we are actually being told that this is not going to be voluntary but there will be this power to dispense with the requirement to have prior consent. I suggest that this is going to create more conflict and more difficulties. Again, perhaps it is not very helpful that the detail has not yet been worked out. This situation is made all the stranger when you observe that this new agency seems to have virtually no governance arrangements. The director-general reports and is accountable to the Home Secretary, who is in turn accountable to Parliament. There is no board; there are no non-executives; there are not even a few token elected police and crime commissioners sitting in that structure perhaps to provide some coherence with the expressed wish of the local electorate about police and crime priorities. There is no mechanism for scrutinising what is happening. Even the elected police and crime commissioners—which some of us were not hugely enamoured of—had these scrutiny arrangements created within the local authority structure. There is no parallel here. Of course, the legislation contains promises that the director-general will be operationally independent, but what will that amount to in practice? How will it be enforced, and who is going to scrutinise that operational independence in the absence of any of those governance structures? Let us be clear: operational independence is not all that it might appear or be cracked up to be. It certainly does not apply to policing equipment. I suspect that most chief officers of police would think that their choice of equipment is very much part of their operational decision-making. I do not personally always agree with them on that, but paragraph 1 of Schedule 4 allows the Home Secretary to make regulations on the use of specified equipment and the NCA director-general will be required to comply. There is not much operational independence there. This is the Home Secretary, to whom he or she is accountable, saying, “You will or will not use this type of equipment”. That hardly sounds like operational independence to me. Then there are the very strange provisions under paragraph 4 of Schedule 5. I am sure that the noble Lord, Lord McNally, will explain to us precisely why these are here. Paragraph 4 creates an advisory panel; a new quango, if you like—from a Government who promised us a “bonfire of the quangos”—and what is this new advisory panel going to do? It is going to give advice to the Home Secretary on whether the director-general has sufficient training to carry out his operational powers. I wonder where they dream up things like this—which cellar in the Home Office is responsible for thinking up new committees to do this sort of thing. This proposal is certainly not a carry-over from the legislation that created the Serious Organised Crime Agency, because it was not thought necessary to have an advisory panel to decide whether or not the director-general of the Serious Organised Crime Agency had the necessary training to carry out their operational functions. So why is it here? Is it because the Home Secretary is planning to replace the current director-general with an individual whose qualifications are so questionable that a panel is needed to test them? That is as may be, but paragraph 5 explains how the Home Secretary can ignore the advice of that panel under any circumstances. We have to question what model of organisation was used for devising the governance structures for the National Crime Agency. The best example of that, one with which the Home Office is intimately familiar, is the relationship between the Home Secretary and that paragon of effective service delivery, the UK Border Agency. That relationship has worked so well in recent months, between the Ministers and the people with executive responsibility of the agency concerned—two impossible demands before breakfast and the agency, of course, has to comply. Finally, I will say a word about Clause 2, which allows the Home Secretary by order—admittedly subject to the super-affirmative procedure—to add counterterrorism to the functions of the National Crime Agency. I have to question whether a decision of that magnitude should properly be done simply by order. Let us also be clear: if counterterrorism becomes part of the functions of the National Crime Agency, it will totally transform the National Crime Agency. This body that has taken two years in gestation merely to talk about a series of organisational silos spatchcocked together will suddenly have spatchcocked onto it an even larger organisation completely distorting and changing the priorities. As the noble Lord, Lord Condon, said, it may or may not make sense ultimately to have counterterrorism as a function of a national agency of that form. However, having been involved in the convoluted discussions to get the current structure in place, I think you have to be very clear about the case you are making before you embark on those changes and very clear about why you want to go ahead with them. The experience in other countries—according to the FBI, for example—is not always a happy one in terms of relationships with local forces regarding counterterrorism. There is a real danger of divorcing a counterterrorism elite squad from ordinary policing, not only in terms of intelligence but also in managing community relations following operational decisions. “British intelligence picked up “talk” from terrorists planning an Internet-based attack against the U.K.’s national infrastructure, a British official said, as the government released a long-awaited report on cyber security. Terrorists have for some time used the Internet to recruit, spread propaganda and raise funds. Now, this official said, U.K. intelligence has seen evidence that terrorists are talking about using the Internet to actually attack a country, which could include sending viruses to disrupt the country’s infrastructure, much of which is now connected online. The official spoke on condition of anonymity and didn’t say when the infrastructure threat was detected and how it was dealt with. Now comes news that a video captured by FBI agents last year and now released by the Senate Committee on Homeland Security purports to show an al Qaeda leader calling on ”covert mujahidin” to launch cyber attacks against The video explicitly calls for cyber attacks against the networks of both government and life-sustaining critical infrastructure, including the electric grid, and compares vulnerabilities in U.S. critical cyber networks to the vulnerabilities in our aviation system prior to 9/11. So – boringly – I was right (again). The question remains are our cyber-defences going to be adequate.